One of the biggest differences of opinion in the wedding photography community is over the choice between taking color photos or capturing the meaningful moments of a marriage celebration on film in black and white. Some prefer the former, believing that the colors of the world help make images of brides and grooms celebrating their nuptials in the Washington, DC, metro area as beautiful as the love they have come to celebrate. Other wedding and engagement photographers insist that only black-and-white pictures can properly convey the drama and the emotions that are always important parts of every wedding day. In our experience photographing weddings in and around Washington, DC, we have found that there is a time and place for both color and black-and-white photography. Sometimes colors can enhance the composition of a picture by complementing or contrasting with other important elements in a photograph, such as the bride’s wedding dress or the groom’s tuxedo. In other instances, bright or bold colors can be an integral part of the story themselves. If the bride has especially striking eyes, for example, or if the groom and/or groomsmen have particularly colorful ties or pocket squares, then it would be a shame to eliminate those elements from the images we capture during a couple’s marriage celebrations. 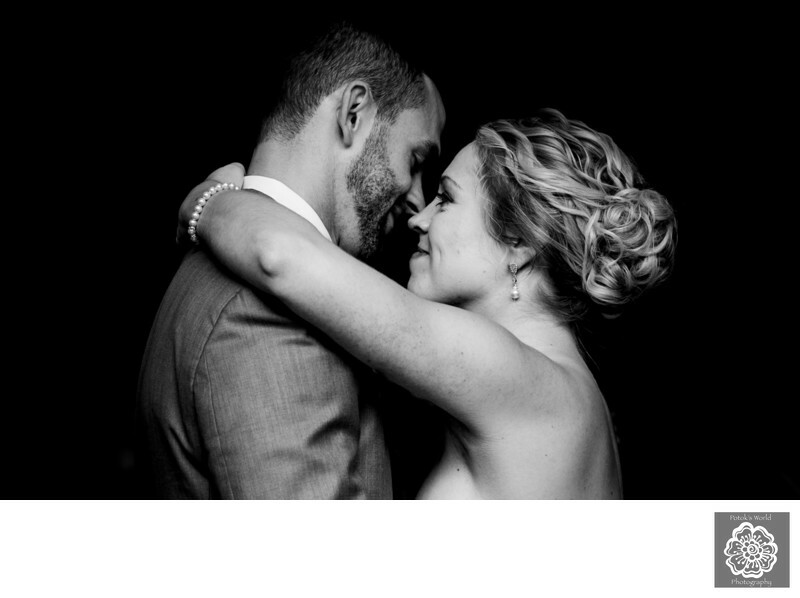 When the colors are not an important part of the story we are trying to tell with our wedding photography, we will often convert a picture to black and white. Color can be distracting to the eye at times, so eliminating it can often allow an image to tell its story in a simpler and more direct fashion. Similarly, when we are trying to highlight the drama or emotional impact of a particular moment, we find that the resulting images work best in black and white. When there is a strong difference between light and shadow in a photo, as is the case it the best black-and-white pictures, the contrast makes the image look very striking and visually pleasing. The photograph featured here is a great example of a picture that looks beautiful in black and white. The story being told in this image is a pair of newlyweds sharing their first dance as husband and wife. Nothing and nobody else matters at that particular moment. Not a single one of the wedding guests exists in the newly-married couple’s world. We wanted to highlight that, so that is why we took this photo using a very tight focal length. We also wanted to eliminate all distracting elements and keep the focus where it belongs: on the newlyweds’ faces and the emotions that are written quite clearly on them. With that in mind, we chose to render the picture in black and white so that we could reduce the distractions and draw the eye to the most important part of the composition. We took this image at Turf Valley Resort & Spa, a lovely and luxurious wedding venue located near the border between the Washington, DC, metro area and the Baltimore metropolitan area. Though this picture was captured inside the resort’s swanky ballroom, the wedding ceremony and the subsequent family formals and couples portraits took place amid the lush greenery surrounding the venue’s golf course. Location: Turf Valley Resort, 2700 Turf Valley Rd, Ellicott City, MD 21042.